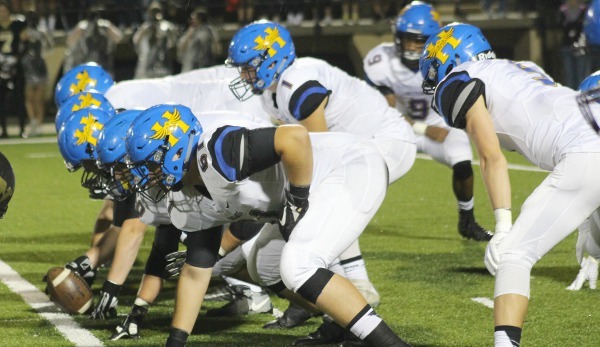 A rematch of Eastern Kansas League rivals will decide a trip to the state semifinals when the second-ranked Blue Valley Tigers host the fifth-ranked Blue Valley North Mustangs on Friday night. The Tigers and Mustangs met back in Week 3 of the regular season with Blue Valley coming away with a 25-7 victory. In the game, the Tigers jumped out to a 14-0 first quarter lead and led 17-7 at halftime before adding a fourth-quarter touchdown for the final margin. Tiger running back William Evans carried 34 times for 158 yards in the game, while quarterback Matthew Dercher passed for 198 yards and three scores. Dercher threw touchdown passes to Evans, Harrison Van Dyne, and Cade Green as six different Tiger receivers caught passes. Evans (6-0. 207) has rushed for 1,291 yards and 20 touchdowns this season and has been especially effective since the playoffs began. In two playoff games, Evans has rushed for 197 yards and four touchdowns against Shawnee Mission South, and 215 yards and four more scores in last week’s win over Olathe South. Evans is a capable pass-catcher with 312 receiving yards and four touchdowns on the year. Dercher has completed 63 percent of his passes on the season for 2,485 yards and 27 touchdowns this season against only four interceptions. The Tiger receiving group has been exceptional with seniors Harrison Van Dyne, Cade Green, and Gus Gomez leading the way. Van Dyne has 48 receptions for 890 yards and nine touchdowns, while Green has 32 catches for 598 yards and six scores. Gomez has only played in six games, but has 18 catches for 279 yards and five touchdowns. Michael Maffry remains one of the state’s top defensive players having registered 141 tackles from his linebacker spot. Blue Valley North has won six consecutive games since a three game losing streak early in the season. Those three losses were to St. Thomas Aquinas (35-14), Blue Valley (25-7), and Bishop Miege (24-6). The Mustangs’ ability to hold Blue Valley and Bishop Miege to 25 and 24 points, respectively, should tell you all you need to know about their defense. That defense is led by safety Harrison Fraizer who has registered a team-high 96 tackles. On offense, Cole Chapman guides the Mustangs having thrown for 1,438 yards and 16 touchdowns against six interceptions. Grant Hamel is the Mustangs’ leading rusher with 1,156 yards and 11 touchdowns on the season. Hamel missed last week’s 20-9 win over Shawnee Mission West due to a nagging injury, but is expected to return. Tight end Dylan Freberg leads the receiving group with 333 yards and three scores on 31 receptions. In the first meeting, the Mustang offense was held to just 141 yards of total offense. Chapman completed only six of 26 passes for 68 yards, and Hamel was held to 56 yards rushing on 12 attempts. Blue Valley North will need to get off to a good start to be able to win at Blue Valley on Friday night. Both teams pulled off “upsets” over higher-seeded teams last week. Free State was a four-point underdog to host Garden City by Prep Power Index and had to travel 335 miles one-way to southwest Kansas. The Firebirds won 42-7. Washburn Rural defeated No. 2 seed Manhattan, 24-21. Each of the opponents were unbeaten this year. Free State, known for several big road wins in the playoffs the last few years, dominated the Buffs with the longest road trip in school history. Free State has improved its defense throughout the season and running back Jax Dineen and quarterback Dallas Crittenden led the offense. Free State’s first score came on a 10-play, 92-yard drive that ended on a 13-yard scoring pass from Crittenden to Bo Miller. A short field off a punt return from Zion Bowlin set up another score. Keenan Garber returned a punt 61 yards with a minute left in the first half for a 28-0 lead. Garden City had just 46 yards of offense in the first half. Dineen tallied 115 yards and two scores, and Bowlin had 113 rushing yards and two touchdowns. Crittenden threw for 112 yards. In its seven straight wins, Free State has permitted 59 points and held teams to 112 rushing yards a contest. Washburn Rural defeated Manhattan for the first time since 1992 and ended a 22-game losing streak versus the Indians. Washburn Rural fell 28-6 in Week 2. The game was tied at 14 entering the fourth quarter. The Junior Blues stopped Manhattan running back Iverson Robb for no gain on the goal line. After the stop, Washburn Rural had a 22-yard field goal for a 17-14 lead. The Junior Blues later extended the advantage on a 1-yard run from Hunter Browning. Rural quarterback Jordan White rushed for 112 yards and passed for 107. Manhattan slightly won the yardage edge, 297-293. Washburn Rural has a collective score of 28-15, while Free State is at 39-13. Rural has played the No. 8 SOS in the classification, while Free State is at No. 26, according to PPI. Since 2004, the Firebirds are 6-0 versus Rural, including 42-14 and 35-7 victories the last two seasons. In the last four years, Free State has made three final fours and one quarterfinal showing, including the semifinals the last two seasons. Rural has its furthest advancement since 1992. This season, the Firebirds opened 1-2 and haven’t lost since. Last year, the Firebirds started 0-3 before eight straight victories. In 2014, Free State was 2-3 before six straight victories. Since the start of 2014, the Firebirds are 7-0 against the Centennial League. Free State continues to improve every year and often makes drastic jumps in some areas as the season progresses. The Firebirds earn the victory.